Transient regional migratory osteoporosis (TRMO) is a rare self-limited syndrome characterized by sudden onset of joint pain, followed by focal osteopenia after a few weeks, with spontaneous recovery. We report six cases of TRMO seen in foot and ankle clinic together with a review of the literature. Key words: Transient regional migratory osteoporosis, magnetic resonance imaging, reflex sympathetic dystrophy. Transient Regional Migratory Osteoporosis (TRMO) is a migrating arthralgia of the lower limb joints associated with severe intercurrent focal osteoporosis at the involved site. It usually affects healthy middle-aged males, with sudden onset of pain, significant functional impairment, but little in the way of clinical findings. First described in the British literature 50 years ago with indistinct diagnostic features, the availability of advanced imaging now makes the diagnosis more accessible. Cases have previously been described but we report a series of cases in the foot and ankle to promote reader’s awareness of the entity, and to encourage correspondence and discussion on the possible etiology and appropriate management. A 45 year-old male presented with right foot and ankle pain in January 2003. He had no recollection of injury to the foot. Clinically, the ankle was warm, swollen and painful to move. Laboratory studies revealed a normal white cell count and CRP level; the erythrocyte sedimentation rate was moderately elevated at 39. Plain radiographs revealed patchy osteoporosis about the ankle. The initial impression was that this was possibly due to a stress fracture and a Magnetic Resonance Imaging (MRI) scan was ordered on the basis of which a diagnosis of reflex sympathetic dystrophy (RSD) was made and he was referred to a pain clinic. He failed to respond to two guanethidine blocks. Several months later, he developed severe pain in his left hip. Clinically, movements at the left hip were painfully restricted. Plain radiographs of the left hip showed evidence of patchy osteoporosis. MR scans of the hips showed an oedema-like pattern in the bone of the left upper femur. A bone scan showed marked increased uptake of isotope at the right ankle and throughout the right tarsal region but excluding the right calcaneum. There was also marked increased uptake of isotope within the left femoral head and less marked increased uptake throughout the left femoral neck and trochanteric region. A biopsy of the right ankle to exclude sinister pathology showed evidence of mild chronic synovitis with no evidence of granuloma formation. At this stage a diagnosis of tuberculosis was considered despite the negative culture and the absence of granuloma formation on biopsy. He was commenced on anti-TB treatment as he had a Heaf test which was strongly positive. A few months later he started to get discomfort in the right knee. At this stage, the right foot and the left hip had improved considerably. Clinically, the right knee was warm and swollen with restricted range of motion. He was mobilizing with crutches at this stage. MR imaging of the right knee performed in September 2003 showed a prominent oedema like pattern in the distal femur, particularly affecting the lateral femoral condyle. There was a small joint effusion, but the appearances did not suggest synovial hypertrophy or soft tissue swelling. Review of all the plain radiographs, the bone and MR scans finally led to the diagnosis of TRMO. In December 2003 he complained of discomfort in the left knee. MR images of the left knee were however normal. Repeat MR images of the ankle showed that it had virtually returned to normal and that there was no lasting damage to the ankle joint. A 53 year-old white female was referred with left ankle and hind foot pain from October 2002. The symptoms were of insidious onset. Plain radiographs of the ankle and hind foot at that stage were unremarkable. (Fig 1) Her symptoms continued to deteriorate over the next 6 months. Physical examination revealed some discoloration of the foot and ankle. There was a small joint effusion about the ankle. Weight bearing was uncomfortable and ankle movements were painful. Laboratory findings were unremarkable. Plain radiographs of the foot and ankle revealed gross osteopenia. (Fig 2) Bone scintigraphy confirmed marked increase in uptake about the foot and ankle (Fig 3). MR imaging of the ankle revealed minor effusion in the ankle and subtalar joints. T1- weighted images revealed low subarticular signals and low signal in the talus and anterior part of the os calcis. The patchy bone marrow signals were reported to be consistent with a diagnosis of RSD or TRMO. Over the next six months the ankle pain settled with physiotherapy, partial weight-bearing and oral analgesia. Eighteen months after the initial presentation, she started developing moderate pain in the ipsilateral knee. Physical examination revealed minor effusion. Plain radiographs and laboratory findings were unremarkable. MR imaging of the knee revealed joint effusion and a diffuse bone marrow oedema pattern consistent with TRMO. 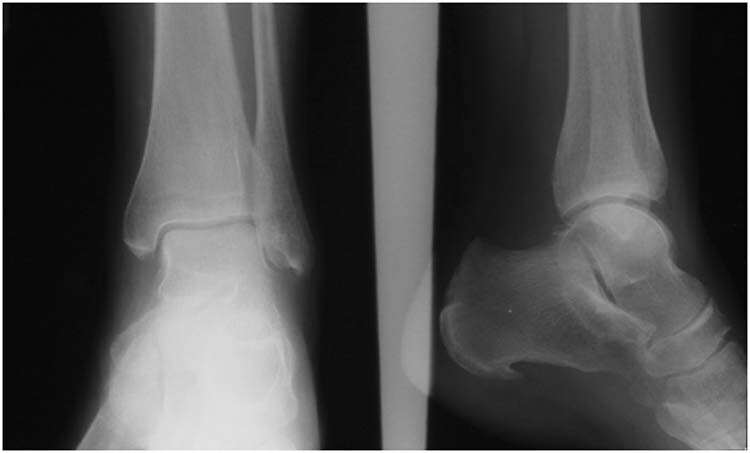 Figure 1 Anterior posterior and lateral views of left ankle demonstrating normal bone density. 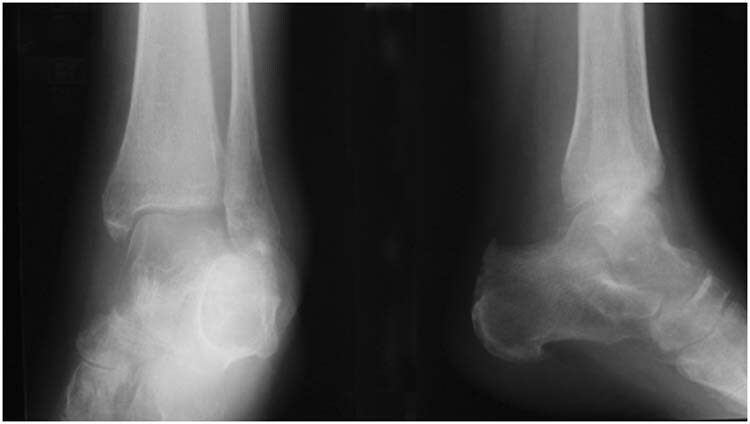 Figure 2 Comparative radiographs performed 6 months later showing marked osteopenia. Figure 3 Radioisotope bone scan showing increased uptake in the talar dome and head, and midfoot. A 60 year-old male was referred to our unit with a diagnosis of septic arthritis of the left ankle. He gave a 7-month history of pain and swelling of the ankle. The symptoms were of insidious onset. Physical examination revealed a diffuse swelling about the ankle particularly and increased local warmth. Plain radiographs and laboratory investigations were within normal limits. 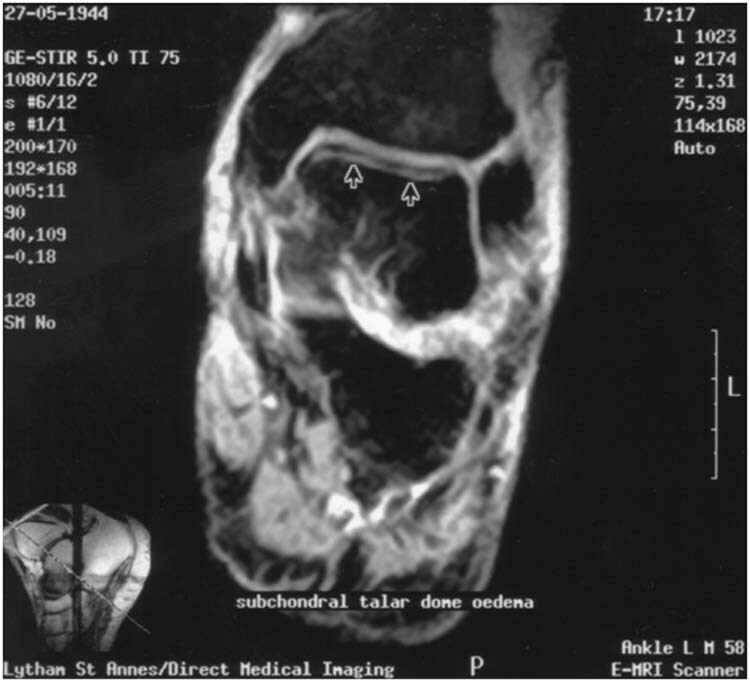 MR imaging revealed marrow oedema in the talar head, the talar dome and within the anterior aspect of the tibial plafond. (Fig 4) There was soft tissue swelling with effusions in the ankle, subtalar and talonavicular joints. The symptoms resolved considerably over the next six months, although he had residual ankle discomfort. Figure 4 A curvilinear area of increased signal (arrowed) parallels the articular surface of the talar dome on a coronal T2-weighted STIR image. Note the oedema in the talar body with increased fluid in the sinus tarsi with surrounding soft-tissue oedema. A 34 year-old male was referred with a six-month non-specific hind/midfoot pain following a twisting injury. He was found to be hyperalgesic, with no other signs of chronic regional pain syndrome (CRPS). Physical examination revealed diffuse swelling about the foot and ankle with some tenderness. Laboratory findings were unremarkable. Bone scintigraphy demonstrated increased uptake in the hind/midfoot as well as the left hip. Plain radiographs of the hip revealed an almost healed transcervical femoral neck fracture. MR imaging again showed extensive high signal changes in the hind foot. By this stage he had developed a stress fracture of the 4th metatarsal. The symptoms resolved slowly over 12 months with symptomatic treatment. He is now back at work. A 60 year-old white male was referred for a second opinion. He had been diagnosed with osteomyelitis of the talus. He gave a 9 month history of right hind foot pain. The symptoms were of insidious onset. Plain radiographs revealed generalized osteopenia, with an apparent lytic lesion in the talar neck. Laboratory findings were normal. Bone scintigraphy revealed increased uptake in the hind/midfoot. Labeled white cell scan was negative. MR imaging demonstrated extensive high signal changes and a diagnosis of regional migratory osteoporosis was made by the radiologist. The symptoms resolved slowly. He returned a year later with similar symptoms on the left foot. MR imaging at that stage showed complete resolution on the right. The symptoms eventually settled on both sides at six month follow-up with supportive treatment. Table 1 Comparison of the cases. The aetiology of TRMO remains unclear. Curtis and Kincaid  proposed a neurogenic compression hypothesis suggesting that TOH in pregnant women may be determined by a mechanical compression of the obturator nerve. Rosen , Arnstein8, Bray, et al.,  suggested an impairment of venous return and local hyperaemia. Lequesne  advocated that TO is caused by non-traumatic form of RSD, a theory supported by Doury. However, TO lacks the vascular and cutaneous changes characteristic of RSD. McCord, et al.,  reported electromyography (EMG) abnormalities in TRMO, which they associated with the commonly seen muscular atrophies. McCord documented denervation patterns coincident in location and time with TRMO attacks. However other reports [12,13] have suggested normal EMG and nerve conduction studies. One of the likely explanations for the pathogenesis of TO is perhaps that proposed by Frost  and others. [15,16] He stated that under noxious tissue stimuli, the ordinary biological processes, including blood flow, cell metabolism and turnover and also tissue modelling and remodelling, might be greatly accelerated, called the Regional Acceleratory Phenomenon (RAP). In his opinion a prolonged or exaggerated RAP in which a large number of bone turnover foci are activated, is the cause of TO. It has been hypothesized that symptoms may be related to bone marrow edema demonstrated at MRI and to a transitory regional arterial hyperflow observed at the early scintigraphic analysis. Bone tissue micro damage is the most frequent noxious stimulus that provokes RAP and bone tissue micro fracture is the main consequence. Several elements support this hypothesis. The repeatedly observed histological findings in patients with TO showing mild inflammatory changes and osteoporosis, associated with an elevated bone turnover with increased bone resorption and reactive bone formation [18,19,20] are a good description of ongoing TRMO. In TRMO, diagnosis is challenging. In virtually all cases the pain gradually improves and the clinical and radiographic findings resolve in 6- 12 months. Although instances lasting eighteen to twenty-four months have been noted, our cases illustrate two examples of TRMO lasting for 24 months and more. This has not been widely reported previously in the literature. Repeat attacks at adjacent sites are characteristic. Several regions may be affected sequentially or the episodes may overlap. [23,24] Usually all the attacks occur within 1-3 years but episodes occurring 11 – 13 years apart have been reported. Occasionally the phenomenon of RMO can recur within the same joint. There are few reports of RMO affecting different regions of the same joint and in the knee there are reports of TRMO migrating from the lateral femoral condyle to the medial and vice versa. [4,25] The condition is distinguished by its episodic migratory nature. No permanent joint damage results from these acute recurrent episodes. A painful joint with localized demineralization is suspicious of an inflammatory or neoplastic disease process. The differential diagnosis must include inflammatory arthritis as rheumatoid arthritis, infectious arthritis, osteoarthritis and crystal arthropathy. [8,16,26] Other diagnosis to be considered includes primary bone tumors, osteomyelitis, tuberculous arthritis, multiple myeloma and metabolic bone disease. Synovial chondromatosis of the hip may mimic TO, but the course is long and irreversible. The history, normal laboratory findings and characteristic imaging usually differentiates TRMO. It is often difficult to differentiate from RSD in the early stages. In RSD, there is often a history of trauma or surgery. Cardinal symptoms are diffuse burning pain in the affected region, sensory disturbances of hypo or hyperaesthesia, trophic changes of discoloration, swelling and thickening, alteration in the skin temperature, autonomic regulation and motor disturbance. [27,28] In the early stages avascular necrosis (AVN) should be ruled out. A long self-limited course, recurrence in other joints and the imaging characteristics help to differentiate AVN from TO. In the early stages the two conditions can be difficult to differentiate, but typically in AVN the pain is present at rest, the limp and antalgic gait are late findings and the functional disability is proportional to the pain level. A prolonged and reversible clinical course, normal laboratory findings, negative cultures and characteristic radiographic findings should lead one to consider RMO after excluding the more common rheumatic diseases and especially infectious arthritis. Vigilance is however required since two authors report cases resembling RMO prior to recognizing tuberculous infection. [3,16] Case 1 illustrates an example where a diagnosis of TB was made before bone biopsies returned as negative for the infection. Tannenbaum, et al.,  described that in two of their four cases the initial diagnosis was that of septic arthritis even though the patients were afebrile and constitutionally well. Three of our cases had an initial diagnosis with an infective cause for their symptoms (osteomyelitis, TB, septic arthritis) despite the patients being systemically well on presentation. Apart from slightly elevated ESR counts, the laboratory tests came back as normal in each case. Antituberculous drugs have failed40 , as have attempts at sympathetic blockade.37,40 Several authors have recommended a conservative, symptomatic approach with protection against full weight bearing. Traumatic fractures of the femoral neck and stress fractures have been infrequently reported in patients with TO.41,42 Some authors have advocated the use of intravenous pamidronate treatment as potential therapy for the condition.35,43 We advocate the approach of mild analgesia with protected weight bearing and physiotherapy designed to enhance muscle function and prevent immobilization. In all our cases symptoms improved only with supportive measures. Case descriptions of TRMO are not always consistent as TRMO is a rare phenomenon and a diagnosis usually made only after other inflammatory and neoplastic causes have been excluded. We highlight the potential problems in establishing the diagnosis due to its unclear etiology and clinical presentation. By presenting a large series of this condition affecting the foot and ankle, we propose that early bone scan and MR imaging should be considered in patients presenting with vague arthralgic symptoms in the presence of a lack of other constitutional symptoms. 1. Ravault PP, Gainet P, Perthier L, Emery J, Carrier F: Rhumatis mes chroniques de la main et rhumatisme neurotrophique du member superieur. J Med Lyon 28: 363, 1947. 2. Curtis PH, Kincaid WE: Transient demineralisation of the hip in pregnancy. A report of three cases. J Bone Joint Surg 41A: 1327 – 1333, 1959. 3. Lequesne M: Osteoporosis of the hip. A non-traumatic variety of Sudecks atrophy. Ann Rheum Dis 27: 463 – 471, 1968. 4. Parker RK, Ross GJ, Urso JA: Transient osteoporosis of the knee. Skel Radiol 26: 306 – 309, 1997. 5. Swezey RL: Transient osteoporosis of the hip, knee and ankle. Arthritis Rheum 13: 858 – 868, 1970. 6. Crespo E, Sala D, Crespo R, Silvester A: Transient osteoporosis. Acta Orthop Belgica 67(4): 330 – 337, 2001. 7. Rosen R: Transitory demineralisation of the femoral head. Radiology 94:509 – 512, 1970. 8. Arnstein RA: Regional Osteoporosis. Orthop Clin North Am. 3: 585 – 600, 1972. 9. Bray St, Partain CL, Teates CD, Guildford WB, Williamson BRJ, McLaughlin RC: The value of bone scan in idiopathic regional migratory osteoporosis. J Nucl Med 20:1268 – 1271, 1979. 10. Doury P: Bone-marrow oedema, transient osteoporosis and algodystrophy. J Bone Joint Surg 76B: 993 – 994, 1994. 11. McCord WC, Nies KM, Campion DS, Louis JS: Regional migratory osteoporosis: A denervation disease. Arthritis Rheum 21: 834 – 838, 1978. 12. Kaplan SS, Stegman CJ. Transient osteoporosis of the hip. A case report and review of the literature. J Bone Joint Surg 67A: 490 – 493, 1985. 13. Keys Gw, Walters J: Idiopathic transient osteoporosis of the hip: brief report. J Bone Joint Surg 69B 773 – 774, 1987. 14. Frost HM: Perspectives: bone’s mechanical usage windows. Bone Miner 19: 257 – 271, 1992. 15. Duncan H, Frame B, Frost H, Arnstein AR: Regional migratory osteoporosis. South Med J 62: 41 – 44, 1969. 16. Langloh ND, Hunder GG, Riggs BL, Kelly PJ: Transient painful osteoporosis of the lower extremities. J Bone Joint Surg 55A: 1188 – 1196, 1973. 17. Negri G, Grassi S, Zappia M, et al. A new hypothesis for the bone marrow edema pathogenesis during transient osteoporosis. J Orthopaedics and Traumatology 7(4): 176 – 181, 2006. 18. Scapira D: Transient osteoporosis of the hip. Sem Arthr Rheumat 22: 98 – 105, 1992. 19. Lequesne M, Kerboull M, Bensarson M, Perez C, Dreiser R, Forest A: Partial transient osteoporosis. Skeletal Radiol 2: 1 – 9, 1977. 20. Funk JL, Shoback DM, Genant HK: Transient osteoporosis of the hip in pregnancy: natural history of changes in bone mineral density. Clin Endocrinol 43: 373 – 382, 1995. 21. Frost HM: The biology of fracture healing. An overview for clinicians. Part 1. Clin Orthop 248: 283 – 293, 1989. 23. Lakhanpal S, Ginsburg WW, Luthra HS, Hunder GG: Transient regional osteoporosis: a study of 56 cases and review of the literature. Annals Intern Med 106: 444 – 450, 1987. 24. Mavichak V, Murray TM,Hodsman AB, Robert NJ, Sutton RAL: Regional migratory osteoporosis of the lower extremities with vertebral osteoporosis. Bone 7:343 – 349, 1986. 25. Wamneck N, Munk PJ, Lee MJ, Meek RN: Intra-articular regional migratory osteoporosis of the knee. Skeletal Radiol 29: 97 – 100, 2000. 26. Levy D, Hinterbuckner C: Transient or migratory osteoporosis of lower extremity. NY State J Med 76: 739 – 742, 1976. 27. Veldman PH, Reynan HM, Arntz IE, Goris RJ: Signs and symptoms of reflex sympathetic dystrophy: Prospective study of 829 patients. Lancet 342: 1012 – 1016, 1993. 28. Fialka V: The diagnosis of reflex sympathetic dystrophy. Eur J Phys Med Rehab 2: 40 – 44, 1992. 29. Geurra JJ, Steinberg ME: Distinguishing transient osteoporosis from avascular necrosis of the hip. J Bone Joint Surg 77A: 616 – 624, 1995. 30. Tannenbaum H, Esdaile J, Rosenthall L: Joint imaging in regional migratory osteoporosis. J Rheumatol 7: 237 – 244, 1980. 31. Gupta RC, Popovtzer MM, Huffer WE, Smyth CJ: Regional migratory osteoporosis. Arthritis Rheum 16: 363 – 368, 1973. 32. Shifrin LZ, Reis ND, Zinman H, Besser MI: Idiopathic transient osteoporosis of the hip. J Bone Joint Surg 69B: 769 – 773, 1987. 33. Trevisan C, Ortolani S: Bone loss and recovery in Regional Migratory Osteoporosis. Osteoporosis Int 13: 901 – 906, 2002. 34. Renier JC, Basle M, Masson C, Bregon C, Audran M: Migratory algodystrophy of the lower limbs involving the foot and complicated by two fatigue fractures: an histological bone study. Rev Rheum. Ed Fr 60: 469 – 473, 1993. 35. Schapira D, Gutierrez G, Mor M, Nahir AM: Successful pamidronate treatment of severe and refractory regional migratory osteoporosis. J Clin Rheumatol 7 (3):188 – 190, 2001. 36. DeBastiani G, Nogarin L, Perusi M: Pig calcitonin in the treatment of localised osteoporosis. Ital J Orthop Traumatol 2:18, 1976. 37. Doury P, Delahayer RP, Granier R, Pattin S, Metges PJ: Highly localised transient osteoporosis of the knee. Arthritis Rheum 21: 992 – 993, 1978. 38. Lagier R: Partial algodystrophy of the knee: An anatomicroradiological study of one case. J Rheumatol 10: 255 – 260, 1983..
39. Naides SJ, Resnick D, Zvaifler NJ: Idiopathic regional osteoporosis: A clinical spectrum. J Rheumatol 12:763 – 768, 1985. 41. Fingeroth RJ: Successful operative treatment of a displaced subcapital fracture of the hip in transient osteoporosis of pregnancy. A case report and review of the literature. J Bone Joint Surg 77A: 127 – 131, 1995. 42. Fokler SK, Vengust V: Displaced subcapital fracture of the hip in transient osteoporosis of pregnancy. Int Orthop 21: 201 – 203, 1997. 43. Carty S, Herdman G, Williams F, Srinavasan U: Transient migratory osteoporosis: rapid response to pamidronate treatment. J Clin Rheumatol 13: 138 – 139, 2007. 1,2,3,4,5,6 Orthopaedic Department, New Cross Hospital, Wolverhampton.